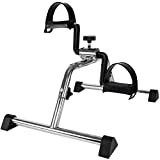 I have purchased a mini portable exercise pedal which comes with the bare essentials of an exercise bike- with only the bicycle pedals and adjustable nobs to change the resistance. The equipment is very portable- you can just take it up and carry from place to place…put it under your desk or while reading a book or surfing net on your phone….sit on your chair and pedal away. 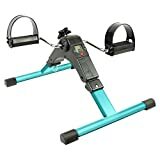 In terms of losing weight or burning calories, I would think that the mini exercise bike or exercise pedaller is not that effective in weight loss compared to running or other aerobics activities. Unless if you pedal away like a lunatic and use resistant bands for upper body workouts at the same time. 1. Increased circulation- less numbness on the legs. It is good for those with knee or back problems who find high impact exercise difficult (however do consult your doctor first if you have any medical problem before starting on this). 2. Literally no PMS…. if I happened to use the exercise pedal on the day before my menstruation, there is literally no pain or discomfort. Ladies who have severe pain or cramp during menses may want to consider trying one of these (the rebounder is also very effective). 3. Any exercise is better than no exercise. I’ve developed the habit to use the exercise pedaller while reading a book, surfing net using my phone or watching tv. It is something I quite enjoy doing. For example, before i watch TV I would put my exercise pedal in front of me first (sometimes I alternate with other equipment or combine with resistance bands) . Sometimes we may get put off by tough exercises but it is easy to incorporate pedalling as part of TV watching. RELATED: Thought of quiting the gym? 4. 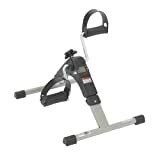 The exercise pedal is lightweight and easy to carry around…to the living room, outdoors, study room, bedroom. 5. To a certain extend, if you use it consistently it does strengthen at least the calf muscles. However…a little word of caution though – sometimes when I pedal too long without stretching or getting up I do feel my knee getting a little painful the next day when I climb the stairs to my office. For me it is because I do have a pre-existing knee condition (osteoarthritis and lower back issues) so many types of exercise would give discomfort to my knees and lower back. I find getting up to stretch the hamstrings and lower back muscles does help. But overall I still find it makes a difference and my legs does get a little stronger. I could stand for hours…there is discomfort which goes off with some movement. It is unlike the past when I felt my lower back or knees jammed painfully. Any type of exercise- done consistently is bound to reap benefits. 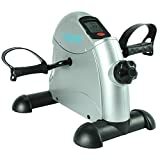 If you are looking to torch calories and lose tonnes of weight then this mini exercise bike is not for you. But if you have numb legs, weak knees that cannot take high impact exercise or seniors whose legs feel weak and wobbly- you can give this little inexpensive portable pedaller a try. However in Malaysia, it is not sold in normal sporting goods store. I could only found it in stores specialising in physiotherapy or rehabilitation products. I bought mine (photo above) from Lifeline (lifeline.com.my) store in Subang Jaya, Petaling Jaya, Selangor for RM99.